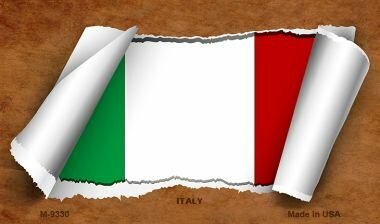 Italy Flag Scroll Novelty Metal Magnet M-9330 MINI Licence Plate Magnet by Smart Blonde at MZ Italia. MPN: M-9330. Hurry! Limited time offer. Offer valid only while supplies last. 3.5'' x 2'' high gloss metal with magnet on the back. Made of the highest quality aluminum for a weather resistant finish. It is lightweight durable. 3.5" x 2" high gloss metal with magnet on the back. Made of the highest quality aluminum for a weather resistant finish. It is lightweight durable. Proudly made in the USA.